After years of hard drought, citizens in California got used to dealing with water restrictions, the new state laws made those restrictions lasting, and they will even impose stricter limits in the future. As wasting water nowadays is very costly, people are forced to consider new ideas to sustain the landscaping with whatever look you wish to achieve. Landscaping in lower water conditions has many options; you can call them “drought tolerant”. Actually, there are several categories of plants appropriate for poor water yards, such as shrubs, trees, annuals, grasses, and groundcovers. Along with using the right plants, you can personalize your landscape with decorative objects, gardening, and construction techniques that will keep natural moisture and rainfall. Getting to know the basic principles of landscape design professionals will get you amazing designs and looks, and your yard will complement your home. Just think about trees, mid-size shrubs, small perennials, and groundcovers, this will create an overall harmony to your yard. You can even use tall trees to make high walls for your privacy. If your yard is small, you can make vertical gardening. In fact, there is no best time to use artificial grass, just use a schedule that works best for you. However, some people realized that early spring installation of artificial grass puts it under your feet from a beginning of the outdoor living season. Also, early fall installation is a good time, as the natural grass is slowing down, so you can get rid of it to have amazing grass all winter time, and when spring comes, you are ready to play. Artificial grass can help improve your indoor landscape, as it never absorbs moisture, and you can install it anytime you like. 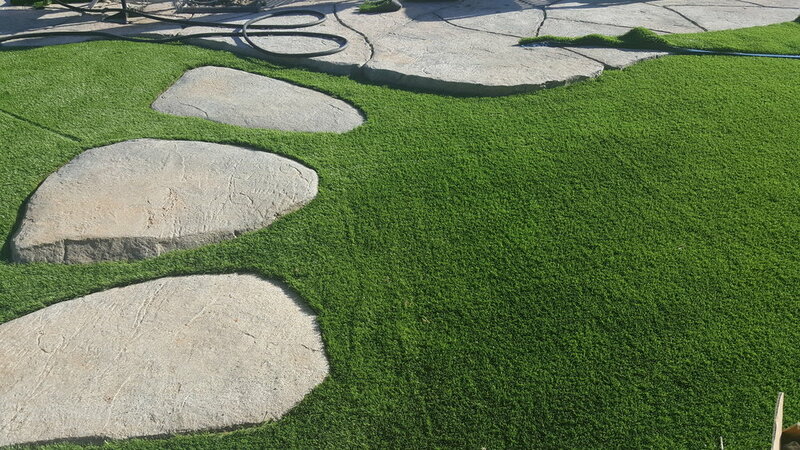 The sooner you can have artificial grass in place, the sooner you can build out your drought tolerant landscape plan. There are several ideas where you can change your property into a nice and pleasing space. Location is very important, as landscaping ties your whole property together, regardless of size of your yard and how you are going to use it. Whether placing the grass in front yard or backyard, it will be just wonderful to use plantings and hardscape elements, or even colorful vegetation as drought-resistant plants. All you need to is consider the setting. How much shade or sun the yard receives, and at what time of the day, this is vital to consider. It’s very important to match plants with their preferable comfort zones. Beyond plants, you may think how to use geometric or curving pathways, dry rivers of stones or watering holes for buffer flies. So it takes more than shrubs, trees or small plants to create a good landscape. While choosing the appropriate plants, you may consider height and width at maturity, leaf color, shape, and size, bloom time and color, fall and winter interest. There are countless amazing ideas on how to build your landscape with the least cost and requirements. In keep its clean appearance, however, an occasional washing with clear water can be done from time to time. Cleaning is done depending on how complicated dirt is. Those well-known shade structures are very common in the market, and you can easily identify original brand stuff.